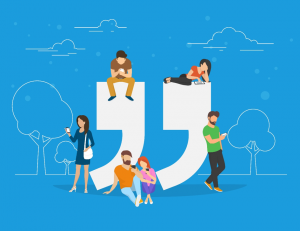 If you have a website, you sell products and you interact with customers on a regular basis, chances are that you’ve considered using testimonials in your marketing approach. While testimonials do make a lot of sense when it comes to building credibility, you have to use them right to get the best possible results. Making testimonials persuasive without taking away from their authenticity is a tricky task. Still, there are things you can do to stimulate your clients to be genuine and detailed when leaving reviews. Accomplishing this goal is not easy because it may seem like you’re demanding too much from your audience. Still, there are things you can do in order to receive long-form testimonials that prospects will be drawn to. Long copy tends to perform better than short and precise quotes because it gives readers more information. In addition, the different format could potentially get the audience engaged. Most businesses feature testimonials that span a line or two on their websites. While these may work, they tend to be superficial most of the time. Here’s just one example of a long-form testimonial. FreeAgent is a company that uses clever formatting and longer texts to provide potential clients with credible and interesting information. Pictures, names and professional occupations are added to each one of the reviews for the purpose of increasing their trustworthiness. As you can see, there’s nothing innovative in the formatting or the presentation of the information. There’s no video, no multimedia, no popup images. 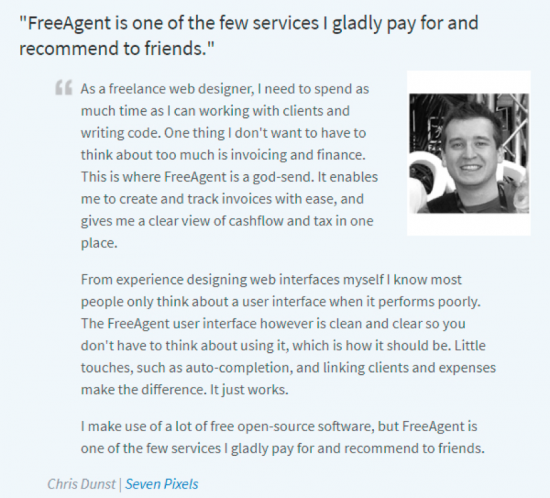 FreeAgent has smartly allowed the text to speak for itself. Now that the importance of long-form testimonials is clearly understood, it’s time to take a look at the best ways to stimulate former clients to produce such reviews. Why did you seek the specific product or service? What problem were you attempting to solve? Who are you, what’s your occupation and why were you in need of the respective product or service? What was your experience like? What did you like? What didn’t you like? Did you experience sensible improvements or product resolution as a result of using the product? What happened? The purpose of these questions is to encourage story-telling. If people are sharing a little bit about themselves with the world, the story will be seen as much more relatable. It’s possible that your clients don’t have the time to produce a testimonial that’s 300 to 500 words long or even longer. If this is the case, you can conduct a brief Skype or video chat interview. Ask the questions, record the answer and write the testimonial yourself. Don’t forget to get your client’s approval prior to publishing. This aspect of persuasive testimonial creation has already been touched upon but it merits some elaboration. Testimonials that are overly positive tend to be less credible than the ones that come with a balanced tone. In fact, the inclusion of negative information in client testimonials could potentially be highly beneficial in terms of generating more sales. Negative reviews speak of authenticity. You’re not editing the words of your clients and you’re not afraid to present their experiences just like these occurred. It’s impossible to have solely 100 percent satisfied clients. Your prospects know that. If you attempt to paint unrealistic pictures, you’ll alienate potential buyers right from the start. Here’s an example of a company that’s getting a rather negative reputation. Technocrati began receiving dozens of negative reviews on Glassdoor after a decision to shut down a well-established contributed content program. Technocrati, however, stood by its decision to rebrand. This decision rendered the content program obsolete and regardless of the bad reputation, the brand was adamant on transforming itself. Needless to say, the negative reviews stood as evidence of a shift. The shift was soon over and the rebranding effort was more or less deemed successful. The example mentioned here is an extreme one and it’s definitely something you shouldn’t be striving towards. What matters is giving your clients a platform to speak freely about their experience. Others will appreciate the genuine vibe. You don’t need text-based testimonials. While these can add a bit to your search engine optimization strategy, the standard format is becoming truly boring. Video testimonials are the way to go. They show the face of your clients, they present a bit of personality. When people can put a face to the information that they’re receiving, the whole presentation will be deemed much more believable. There’s an added reason why multimedia is so important. Visual content is 40 times more likely to get shared on social media. If you want to increase the viral potential of your testimonials, well-filmed clips will be the way to go. If you do a bit of research, you’ll come across many creative and beautiful video testimonials. ChowNow’s review page is just one of the stellar campaigns out there. For a start, ChowNow presents the name of the client, the sub-niche they specialize in and a brief quote. The quote that’s taken out of the video sums up the essence of the testimonial. Anyone who’s interested in getting additional details can watch the video itself. The videos themselves work really well because they present the clients and their business before speaking about ChowNow. It’s not just a person sitting in front of a camera, it’s a short film that tells a story. As already mentioned, telling a story is imperative for making testimonials persuasive. One of the biggest mistakes is presenting overly-generic client reviews. We’ve all seen them on multiple corporate websites. These reviews are so stereotypical that people don’t even bother to read. Instead of going down this rabbit hole, you may want to do a bit of segmentation. The ChowNow example mentioned above can be used to illustrate this principle, as well. Each video tells what kind of restaurant or café partnered up with the brand. There’s a testimonial by a Mexican restaurant owner, another one by a person owning a burger place or a seafood restaurant. Do a bit of market segmentation. Figure out which group of people is most likely to use your products and why. 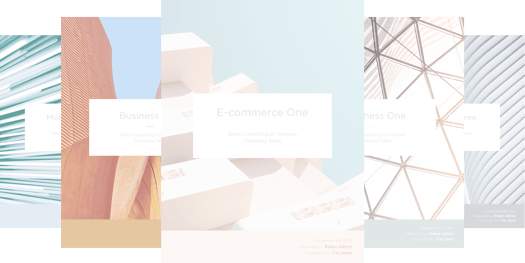 When you have this information, you can create a niche testimonial presenting one of the industry’s representatives that you’ve already partnered up with. If you don’t know what’s going to work for your business, you may want to test radically different approaches. This way, you’ll get metrics that will justify one approach or the other. You will also figure out whether the audience you’re targeting is the right one. While production value does matter and testing out different approaches may be expensive, it’s still important to remember that inbound marketing is one of the most cost-efficient possibilities out there. In addition, doing an A/B test will be much more affordable than running a campaign that will never deliver the results you’re hoping for. These are just a few of the approaches that will make your testimonials more relevant and relatable. Picking one approach or the other will depend on the specifics of the campaign, the specifics of your audience and the results that you want to get. One final thing to remember is that your reviews should always be traceable. Present your clients, their businesses and their specific needs. When people can check this information and find out that the reviews are created by actual people, you’ll score high on the credibility scale. Thus, a review is as much about highlighting your clients as it is about presenting your products and services. Keep this fact in mind and you’ll soon see the performance of your testimonials page improving significantly. Alice Clarke is a marketing expert and a writing coach at Topaussie review. She enjoys travelling and diving. Follow her on Facebook. Previous Ask an Entrepreneur: How Do You Maintain Work-Life Balance?